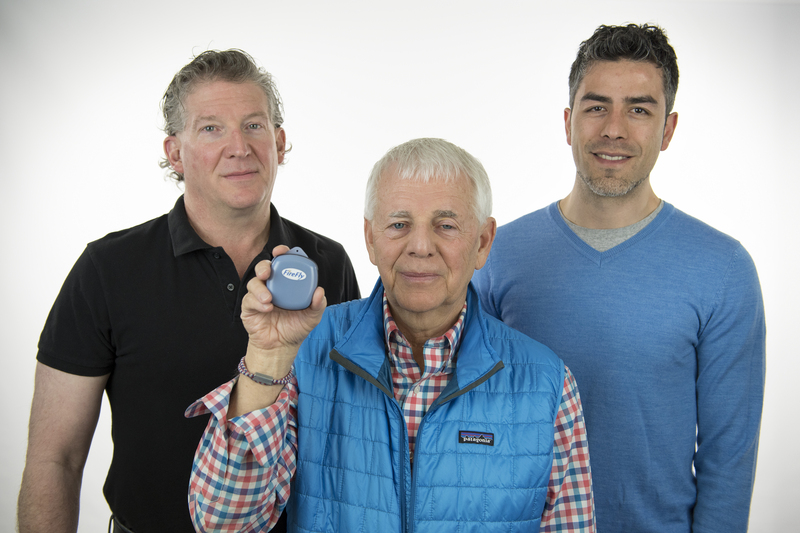 PNNL researcher James Skorpik (center) holds the golf ball-sized acoustic gunshot detection sensor that contains a Wi-Fi enabled micro controller, microphone, and battery. Michael S. Hughes (left) and Eric Gonzalez are co-developers. 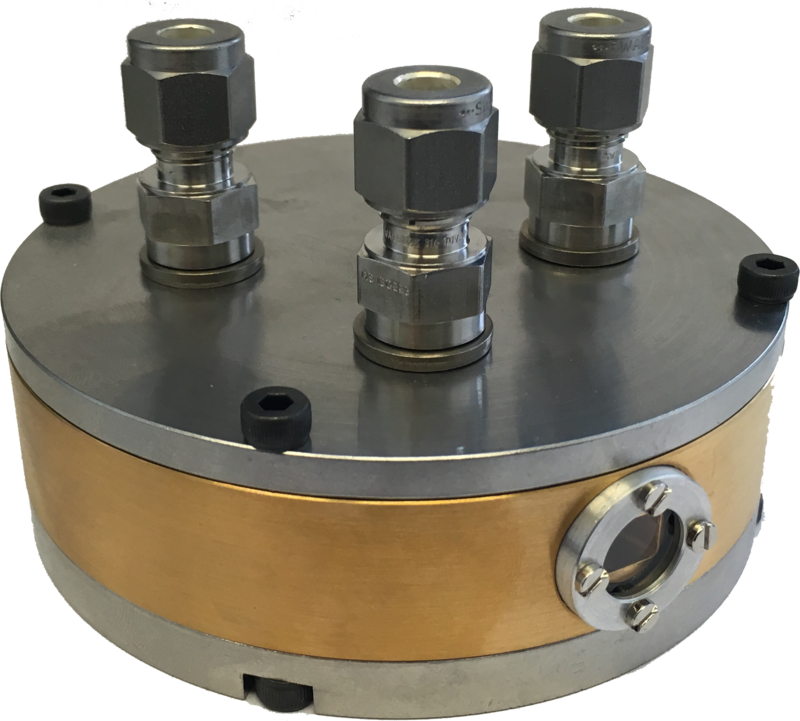 The solid construction of the IRcell provides increased stability and ease of integration compared to current multipass gas cells. Results and data obtained through Xenon International will be used as the next generation of treaty monitoring instrumentation. Data from this system will be reviewed and categorized in order to determine if nuclear weapons testing has occurred. Several federal agencies share the mission to reduce nuclear weapons across the globe. 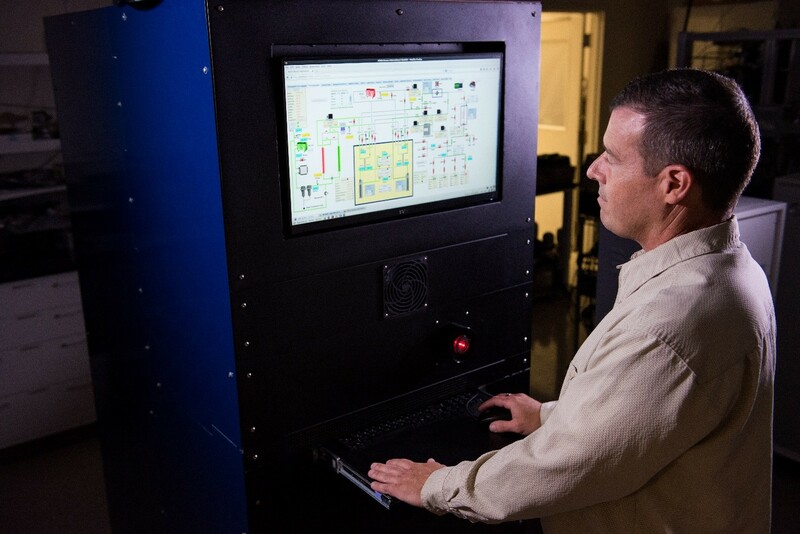 As such, DOD, DOS, and DOE came together in a unique partnership with PNNL and TBE to produce a system that was appropriate for international monitoring and commercial sale. RICHLAND, Wash. — In a world increasingly powered by technology, the transfer of innovations from research institutions to industry often serves as both the conduit and catalyst of national progress, security, and prosperity. The Department of Energy's Pacific Northwest National Laboratory recently received four awards from the Federal Laboratory Consortium in recognition of the dedication, ingenuity, and collaboration required to successfully move new inventions into the marketplace. The laboratory has received 92 FLC awards since the program's inception in 1984. The Acoustic Gunshot Detection technology, licensed to SecurityUSA Services, LLC, instantaneously detects a gunshot indoors with a high degree of accuracy, providing information on the weapon type (caliber) and, depending on system configuration, the location of the gunshot. This information, coupled with a notification, can help enable first responders to take swift action, initiating emergency and law enforcement response measures. PNNL recognized the acoustic sensors it had developed for other federal government applications could readily be adapted to potentially limit the loss of life during mass shooting events. After testing and validating its methodology in real-world settings, PNNL implemented a licensing strategy that allowed for a total of four concurrently-active licenses to facilitate broad deployment of the technology in the marketplace. One of the licensees, SecurityUSA Services, signed a license agreement with PNNL in March 2017 and now has a product that includes PNNL's detector installed in schools and other potentially vulnerable venues. A new ethanol-based jet fuel blend, jointly developed by PNNL and LanzaTech, holds the potential to transform the commercial aviation industry. It promises to lower the cost and the carbon footprint of jet fuel and trim the 900 tons of global carbon dioxide emissions linked to jet aircraft. Using ethanol from any sustainable source, including waste gas captured at steel mills, energy crops, cellulosic residues and municipal waste, the catalytic process converts ethanol into alcohol-to-jet synthetic paraffinic kerosene. Called ATJ-SPK, the fuel blend is cleaner-burning and, when blended with petroleum jet at 50 percent, is fully pipeline ready. 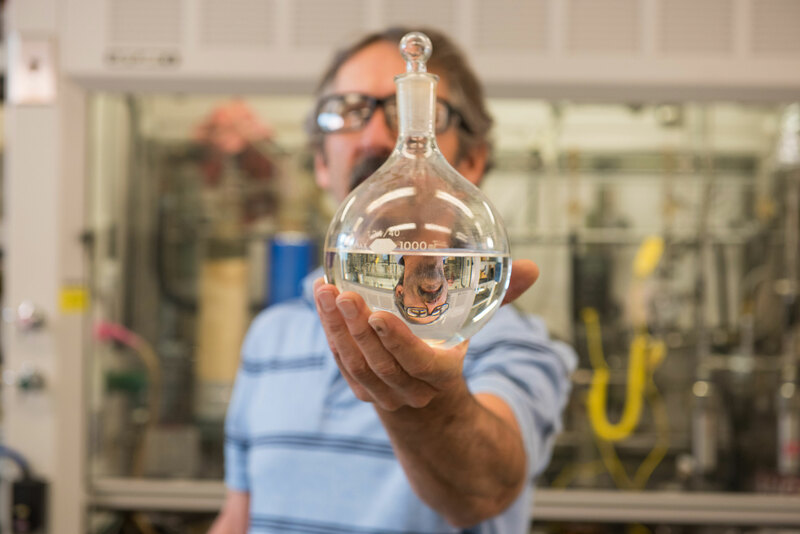 While PNNL developed the key catalytic step in the conversion process, LanzaTech provided the facilities, commercial alliances and the financial support necessary to scale-up production of the fuel blend. The result is a fuel that is already internationally approved and could help airlines meet long-term carbon and fuel efficiency goals, reduce investor risk and open new markets for sustainable ethanol over the next several decades. IRcell is an optical sensing technology developed by PNNL and IRsweep researchers to detect and measure trace amounts of gaseous effluents at their source, such as at manufacturing plants and factories. PNNL and IRsweep were independently working on infrared sensing designs when it became clear that joining forces could be beneficial and potentially lead to a commercially viable product. IRsweep developed a patented approach that reduced interferences and improved the performance of IR sensing, but the overall cell design still needed work. What originally began as discussions of mutual technical interest evolved into IRsweep licensing PNNL's technology, resulting in a product now sold worldwide, revolutionizing optical IR absorption spectroscopy and gas sensing. Xenon International, a high-performance, next-generation detection system for use in nuclear explosion monitoring networks, was recently recognized by the FLC with an Interagency Partnership Award because of the project's success in bringing together various U.S. government agencies, including the Department of State, the Department of Energy and the Department of Defense, as well as a commercial manufacturer, Teledyne Brown Engineering. This collaboration enabled the field-based system to become commercially available for deployment both internationally and domestically, offering the world improved methods for monitoring radioxenon gases that are released during underground nuclear weapons testing. In recognition of their achievements, the four PNNL teams will be honored at an award ceremony on April 24, 2019 at the FLC national meeting in Florida.